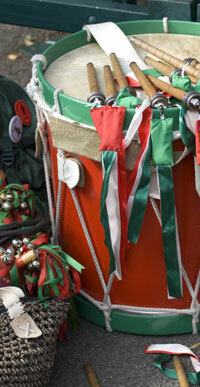 Hertfordshire Holly is a North West Morris side based in Hertford. We perform mainly traditional dances along with one or two written by members of the side. We welcome new dancers and musicians, both male and female. See our Program for details of where to find us. Practice nights are usually at High Cross Village Hall. If the venue is changed details will be posted on the Program page. In 2019 Hertfordshire Holly will celebrate its 40th Anniversary. Are you a past member of the side? If yes, please get in touch and we will invite you to our Grand Reunion. Contact details are on our Contacts and Links page.